Room One is putting on a play about explorers looking for the New World, including ships and sea captains and everything. Junie B. Jones thinks she might be the star of the whole entire production. Only, sailing the ocean blue is not as easy as it looks. Illustrations. From the front Cover Ship Ahoy! Room One is putting on a play. And guess what? It's about explorers looking for the New World! And there's ships and sea captains and everything! 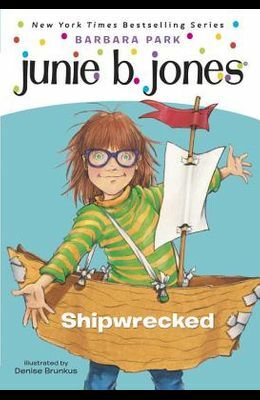 Plus here's the bestest news of all--Junie B. Jones thinks she might be the star of the whole entire production! Only, sailing the ocean blue is not as easy as it looks, apparently. 'Cause problems keep on happening. Like the actors keep catching the flu. And bossy May keeps trying to take over the show. Can this play be saved? Will the ships ever get to land? Or is Room One in for a disaster at sea that they will never forget? From the Hardcover edition.